You’re busy, you don’t like pain, and you want to save money — basically, you’re a normal, reasonable human being. However, in your efforts to save yourself from pain, expense, and wasted time, you might be making a serious mistake: skipping routine visits to your dentist in Beaumont. Let’s talk about why neglecting these appointments can result in some big-time unpleasant consequences. There is a common idea out there that going to the dentist is always unpleasant, but that is simply untrue. During a routine preventive appointment, you may feel the dentist’s or hygienist’s motions as they clean and examine your teeth, but nothing about the experience should be painful in any way. 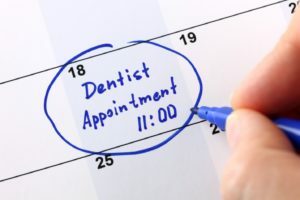 What is painful is when you skip routine appointments and develop serious oral health problems as a result, such as tooth decay or gum disease. If these issues don’t get treated in their earliest stages, you may end up with an agonizing toothache and then have to undergo major dental work, such as root canal therapy or an extraction. These procedures may leave your mouth sore for several days or longer. A routine dental appointment usually takes about an hour. When you factor in the time it takes you to drive to and from the dentist’s office, the entire experience won’t cost you more than a couple of hours. Major dental problems, on the other hand, can be extremely time-consuming. Not only do the procedures required to fix them often require multiple appointments, but they can take a while to recover from. You may have to take a few days (or longer) off work so you can get back on your feet. Most dental insurance companies cover 100 percent of the cost of preventive care, so you can visit your dentist for routine appointments for nothing more than the cost of your premium. Since you’re paying for your insurance anyway, it’s a waste of money if you don’t visit your dentist for a checkup and cleaning twice a year. Insurance is not as eager to pay for major dental work; it may cover just 50 to 70 percent of the cost of restorative procedures. Therefore, if neglect leads to the need for an expensive treatment, you might end up having to pay hundreds or even thousands of dollars to regain your oral health. Sometimes, dental problems develop suddenly, and no amount of preventive care could have stopped them. However, most issues develop over time, and it is possible to stop them in their tracks before they cost you a bunch of money, time and pain. To maintain a healthy mouth and a happy budget, be sure to visit your dentist every six months! Dr. Michael R. Olson earned his Doctor of Dental Surgery degree from the University of Texas in 2003. In the years since, he has dedicated himself to providing his patients with high quality, conservative dentistry that has a strong focus on stopping dental problems before they cause major damage. If it is time for your next checkup, or if you have questions on how to care for your teeth and gums, contact our office at 409-860-9600.